Is The Beyond a zombie movie? It certainly has plenty of zombies, but at its core it’s more of a haunted/cursed house movie with zombies instead of ghosts. Our story introduces us to unlucky Liza, who’s inherited a hotel from her rich, bachelor uncle. It seems as if her luck has turned, but alas the hotel is built over one of the seven gateways to hell (way, way worse than being built over an ancient Indian burial ground, as it turns out). Plagued by a series of accidents and unusual (not to mention unusually awesome) deaths, poor Liza’s plan to reopen the hotel and solve her money woes is quickly derailed. Soon, she’s met a mysterious blind girl who seems to know a lot about what’s going on, a skeptical doctor who refuses to believe any of it and a whole slew of zombies. Things process haphazardly to a slow climax that sees her entering the gateway to hell for a long and likely unpleasant stay. This is a hard movie to judge. It’s the third of Lucio Fulci’s forays into the wild world of the walking dead and while it’s beautifully shot and nicely paced, it doesn’t really make a whole lot of sense. In some ways, it’s a precursor to the slasher film, concentrating most of its energy on a series of creative and outlandish death scenes. A man’s face gets eaten by tarantulas; a woman gets melted by acid into a frothy, bloody mess while her daughter looks on; a woman gets her neck torn out by a dog; a doctor gets a face full of glass; a woman gets her head impaled by a nail (complete with Fulci’s trademark eye-gouging action!). These are really the highlight of the film, and presumably the reason for its existence. The zombies appear only intermittently until the last fifteen or twenty minutes, and then just kind of sway drunkenly while posing a vague, unconvincing threat. They look good, and there’s a definite air of menace to them when they are filling the halls of the hospital en masse, but the movie doesn’t do much with them. And the bits of movie between the death scenes and vague zombie menace are just bewildering and inexplicable. In a generous estimation, you could call it a surreal atmosphere reminiscent of a dream or drug trip. Less generously, you might call it an incoherent mess. And the characters? They exist solely to give the director some people to kill. They are not unlikable so much as unknown and unknowable. Despite its shortcomings, it’s worth a watch. The gore is well done, if a little cheap looking in a few isolated instances. For all of its lack of a coherent storyline or decent characters, it’s remarkably entertaining. For the trainspotters out there, it’s sure to provide fodder for many a conversation about the films it’s influenced: Hellraiser in tone and, to some degree, story; every slasher flick ever in the pacing and buffet of clever death; probably others that didn’t occur to me. 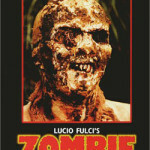 And hey, it’s Lucio Fulci and it’s got zombies. This review was part of the Final Girl Film Club challenge for March. For more info and her takes on many other fine horror offerings, visit her invariably awesome blog early and often. I have lived in a house that was built over a gateway to hell, but I did live in a house that was built on sacred Indian burial ground. Let me just say this, no zombies but not a lot of fun, either. Waaaay haunted. I wonder if I will be able to find this movie somewhere. 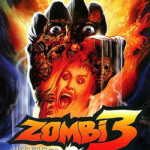 I am having difficulty finding any zombie movie that isn’t a big screen smash hit. Ok, I did find REC, but that was a fluke, I think. Does Netflix service Canada? They have a pretty great selection of zombie movies. I actually saw this on a few lists of zombie movies that enthusiasts should see. Keep the reviews coming.